Kokrajhar MP, Naba Saraniya talking to media in Guwahati. Image: Northeast Now. 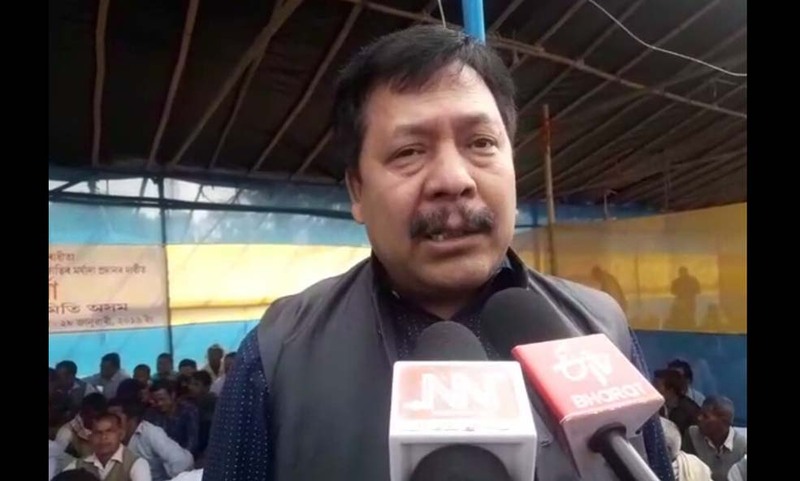 The Member of Parliament (MP) from Kokrajhar Lok Sabha seat in Assam, Naba Saraniya on Monday said that Bodos with only 12-13 lakh voters are enjoying much more privileges and opportunities than other communities with much bigger population size in Assam. “With only 12-13 lakh voters, Bodos have 12 MLAs, five ministerial berths and lucrative positions in various corporations in the state. But these are their temporary gains. The community will have to face the consequences of in future,” the MP said. Regarding the Centre’s bid to grant Scheduled Tribe (ST) status to six communities in the state, Saraniya said it was only a strategy of the ruling party before the election. He asserted that there was no chance of these six communities getting ST status before Lok Sabha election. Naba Saraniya termed it a strategy of the Centre to divert the attention of a large section of people in the state from the controversial Citizenship (Amendment) Bill 2016 and said the Government wanted to create division among the people so that the protest against the Citizenship Bill gets weakened in the state. The MP aired apprehension that such action of the BJP government in the Centre was going to bring back the forgettable phase in Assam’s history. He alleged that BPF leader and Chief Executive Member of the BTC, Hagrama Mohilary remote controlled the government in Assam headed by Sarbananda Sonowal and said that such importance attached to Hagrama was not a good sign for the political arena in Assam. He commented that the BPF supported the Citizenship (Amendment) Bill and it was an opportunist party by own admission of Hagrama Mohilary. He pointed out that non-Bodos had been deprived of all opportunities and privileges in BTC area where the Bodos only get preference in all aspects including lower grade government/council jobs. The MP lauded the revolutionary spirit of Krishak Mukti Sangram Samity (KMSS) leader, Akhil Gogoi and warned that all those sitting in power had once hit the street and time might come when they would have to again come to the street.